While wading through an exotic codebase, I stumbled upon a static class named Convert. This class contained somewhere around 2700 (non-generated) lines of code, where each method manually converted some object to a simple textual representation. These methods were then used to convert requests and reponses to and from a remote third party service before logging them to the database for auditing reasons. My first thoughts were something along of the lines of "What the.. this is insanely stupid code." This must be a PITA to maintain and be extremely error-prone. Looking at the solution now, it looks simple enough to move that to some infrastructure and have the conversion done by something more generic. Serializing to JSON comes to mind; interpretable by man ánd machine. Trying not to jump to conclusions, I looked for one of the remaining team members, and asked why they made that decision. "Well", he said, "Those remote service calls are expensive as is; it's a slow connection, we have to encrypt everything going over the wire, and we can't make them asynchronously. We optimized where we could. Including logging." I asked if they found serialization to be so expensive that it could warrant all the monkey code. He said yes, but that he couldn't vouch for the decision since they never measured. Later that day, I took five minutes to see how the two really compare. I have this code snippet lying around if I quickly want to profile something. I picked an average sized object graph and ran the benchmark. Turning up the number of iterations to 100 produces following results. This time around, we see a huge relative difference; doing it manually is 9 times as fast. The absolute difference is still neglectable though. 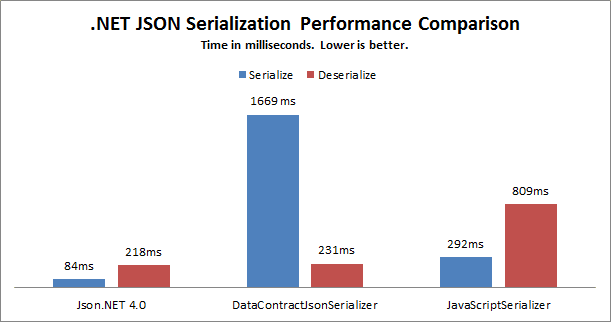 As it turns out, for this specific scenario, with this specific serialization library, the overhead of serialization would be very tolerable. Other serialization libraries might produce less tolerable results though. It's important to measure this stuff; I'm (re)learning almost daily that assuming is a mistake. While skimming over future features of ASP.NET Web API, I came across the ASP.NET Web API Help Page feature. I couldn't find an introduction online, and the Nuget package has only been downloaded 16 times, so I had to have a really quick look. I documented my baby steps below. So, I had a really simple ASP.NET MVC4 project, with one API controller exposing tweets. /// Get a <c>Tweet</c> by its identifier. /// <param name="tweet">An instance of <c>Tweet</c></param>. /// Deletes a <c>Tweet</c> by its identifier. To add the Help Pages feature, I added the Nuget package to my MVC project. This adds a new area, containing a bunch of code. Browsing to the area's default url now, you already get to see something like this. There are a few things missing though. Most importantly, where is the documentation I provided in the controller? To expose the existing documentation, enable generation of the XML output. Then open the HelpPageConfig class, and set the documentation provider - we can use the default implementation included in the package. That looks better. There is one more thing I'd like to get working: samples of the different representations. This can also be configured in the HelpPageConfig class. This produces a nice sample for consumers of the API. All of this took me five minutes to get working. There seems to be a lot of room for optimizations and customizations. You can configure a bunch of stuff in a centralized spot, tweak the code - it's not in a separate assembly, and you can adapt the views however you like.